Tom Molnar has done it again by further refining the state of the art in H beam connecting rods. Molnar Technologies rods are the result of continued developments and improvement of the high performance H beam rod design. These conrods are the product of an engineering staff with in excess of 30 years of hands on work in the field of designing, engineering and distributing some of the best steel connecting rods for high performance and racing engines. Tom Molnar, the owner and driving force of Molnar Technologies, has a proven himself time and again as one of the premier rod designers in the performance and racing parts aftermarket. Molnar Technologies works hard to deliver high quality performance engine products, at affordable prices while at the same time providing superior customer service and tech support. All rods listed below are H Beam except where noted as I Beam. Molnar LS Power Adder rods, Stroker version provide additional clearance when using a stroker crank. 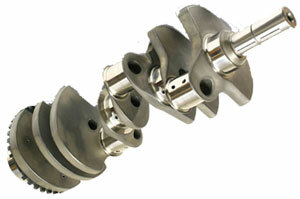 Recommended when using a 4.125 or longer stroke crankshaft. Molnar LS Power Adder Plus Rods for extreme high output engines. For turbo, supercharger or large nitrous shot. Gen III Hemi Power Adder Rod. Use with turbo, supercharger or large nitrous shot. 6.4L OEM length and journal size but with .927 wrist pin. Hemi Power Adder Rod. Use with turbo, supercharger or large nitrous shot. PWR ADR™ series rods. Extra heavy duty for high boost and/or nitrous. Use with CB-1227H or equivalent bearing. Bronze bushed for use with floating piston pin. For use with press fit piston pin. NOTE: Will not fit stock cast pistons with tapered cuts on pin boss support area. For normally aspirated engines or turbocharged engines using less than 20psi boost. Extra heavy duty for High boost or boost and nitrous. Recommended when using more than 20psi boost. European spec engine. Please confirm big end width of your rods and be sure these match. US version has wider BE width. If you do not see a set of rods on our site which have the dimensions you need a set of custom Molnar Technologies Rods are a potential solution. Molnar Technologies can make custom rod sets for many different domestic, Sport Compact and powersports engines. Please contact us for assistance with custom rods.